As of ideas gently slamming, slamming against my brainpan door. Only this, and then repeat them more. So–take any old pattern–say the daisy that probably every doodler in the world chooses as his/her first doodle. Add a dash for decoration, a circle, a slash. Make some dark, make some light. Keep adding more on ’til you’ve got a bunch. And hey! That old overused pattern looks kind of nice. It’s sort of like making goulash. There isn’t much in the house, so you fancy up what you’ve got. Previous Post: My PC has been invaded. Next Post: Yes, I’m back–with a whimper not a bang. Inspired by your designs I googled 'how to draw celtic knots' (found this site http://www.entrelacs.net/) for better understanding how to weave them. It seems to be easy and complex at the same time – I will work on this too. I don't really enjoy the traditional method of doing interlace though. 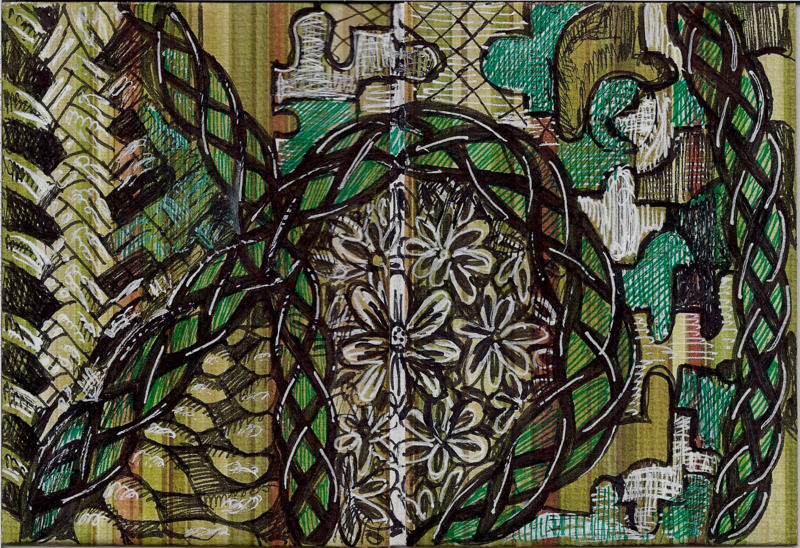 and don't really think it is zentangle friendly, because it requires too much pre-thought and drawing. I'm not sure my methods are a whole lot easier, but my goal is to come up with patterns that can learned and drawn in the same way as other zentangle patterns. The traditional methods are best though, if you want very precise interlace. But I think it's a seperate discipline from zentangling. I agree! Celtic knots are a class of its own. Thanks for the link, I will have a look at that site. Less for zendoodling them than for the fun of weaving knots ;-).